in most of these incidents dogs are involved … and sadly some dog-owners simply don’t know how to behave when walking through a cow pasture! there has been a court desicion on the deadly cow attack in 2014. the farmer was sentenced to pay almost EUR 500000,-- to the widower and his son! if the higher court will confirm this ruling it will have a huge impact for tourists, hikers and of course the farmers all over Austria. 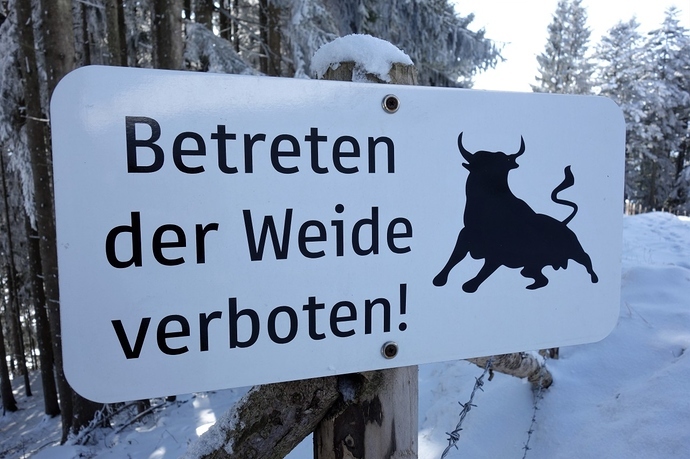 A German woman was trampled to death - and now Austrian farmers fear extra security costs. 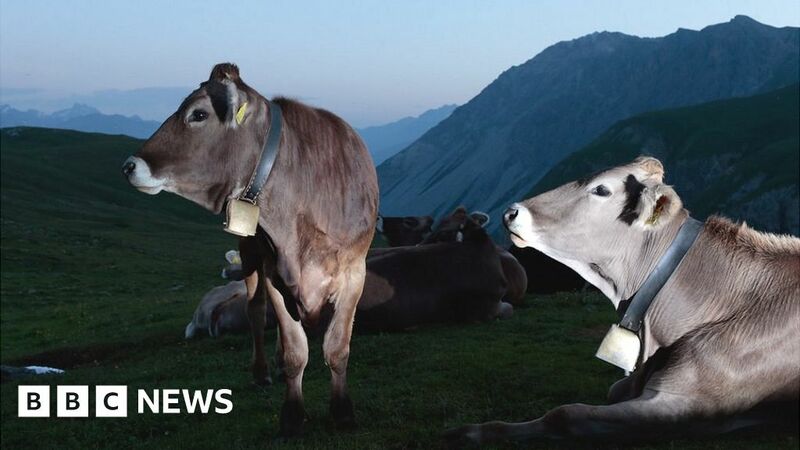 some farmers are beginning to think about closing their pastures for tourists or to stop alpine farming at all. Let’s hope that the courts will revise the verdict. Otherwise a lot of restrictions for hikers might follow. Cattle are either curious or hungry, on farms I have had cattle follow my car up to the summit. Thinking I was the farmer with feed for them. There is a drought here so a lot of hand feeding, the cattle hung around where I was setting up aerials etc and after a while when no nice tidbits were forthcomming quietly moved away. Other occassions they are just plain out curious as to what is going on and soon move away. 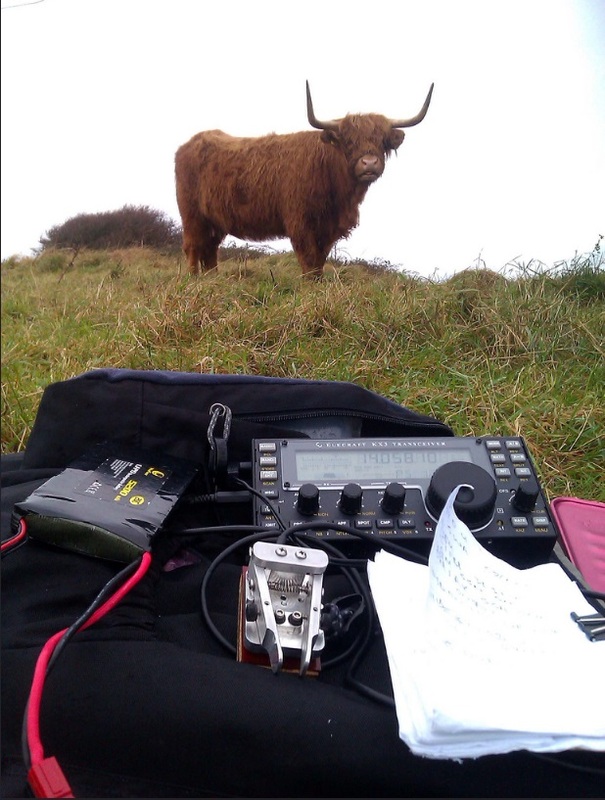 I found myself surrounded by these docile beasts after a session on 14Mhz CW . Cattle behavior will vary from breed to breed and on local farming practice. Here dairy cattle are mostly very docile and domesticated but outback beef cattle are really just wild animals. Our Alpine cattle are somewhere in between. These are the ones SOTA activators are more likely to encounter. If you encounter dairy cattle either they have escaped or you are trespassing. My experience relates to young cattle being the most curious and wondering if something new is edible. All cattle will approach if they think you might fed them. Don’t feed them. The German video is good. Dogs and cattle can be a bad mix. 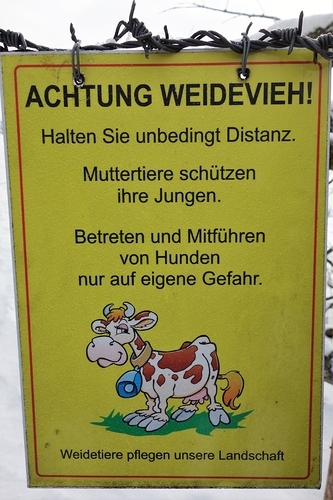 Also be wary of a cow with a calf as has been said. If you go about the activation quietly (in VK at least) any animals that wander up will wander off once they are satisfied there is nothing new to eat and you are not going to attack them or their offspring. None of them know that one day you might eat them. The worst I have suffered is a large green pattie on the path where I needed to step. 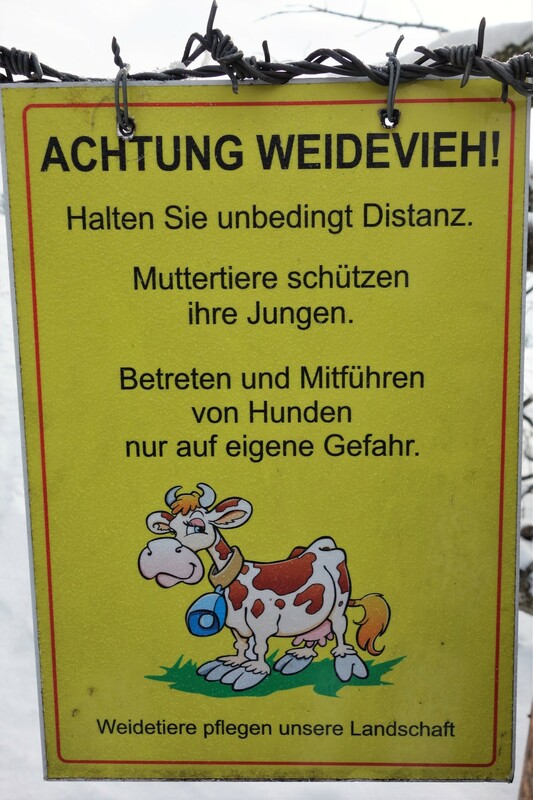 If you encounter dairy cattle either they have escaped or you are trespassing. That’s not true in many countries. For example, in England and Wales there are about 170,000 miles of public rights-of-way (public footpaths, many ancient) much of which cross farmland (with dairy cattle) not to mention right-to-roam ‘access’ land. So most walkers here will regularly encounter dairy cows. Scotland allows even more public access. As many have said, the risk is mainly females with calves. Let me clarify and amplify that. In VK private property is just that and you need permission to enter. The presence of stock is sometimes given as a reason for refusing entry. Here in VK dairy cattle are normally milked twice a day and are kept in fenced paddocks. 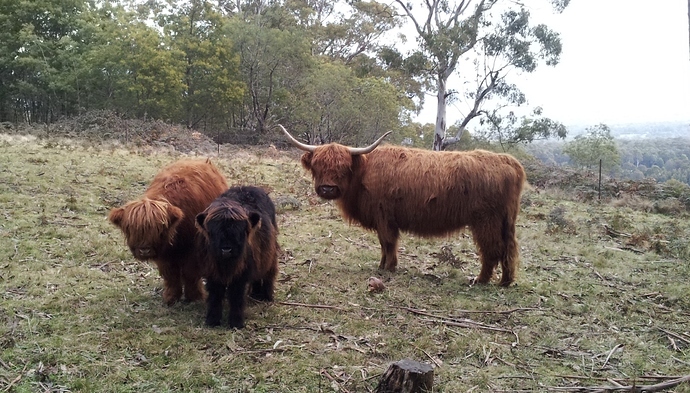 They may be encountered on a road just before or after milking time when being moved to and from a paddock. 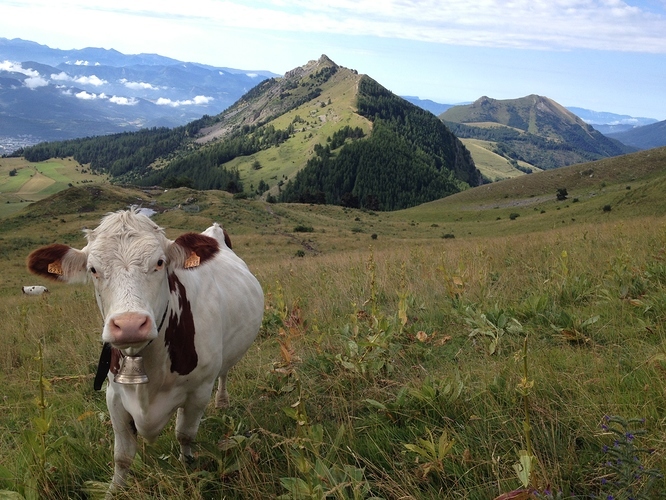 If you are on a VK summit and a dairy cow approaches it is an escapee or you are in it’s paddock. If the latter you will of course have the owner’s permission and some instructions relating to cattle and gates. You are more likely to encounter beef cattle in VK Alpine regions (grazing there under licence) and the usual caveats apply. Having a right-of-way through private property or grazing rights on public land are things that obviously causes problems in some places and is why we don’t have such stuff over here in VK. I strongly recommend not getting into a space that has a bull. Any bull. Even if it is a 10 point summit. Pick a time when the bull isn’t there - the owner can advise on this. In my experience horses are more of a problem in VK on summits and around them. I had one step on my dipole once. Both survived. In VK1, Mt Gingera VK1/AC-002 is known for wild boars. In 2012 I was charged by a family of 10 or so curious to see a 2 legger (urban slang) human. They move very fast and sound like a herd of elephants charging through the aussie scrub. It was clear, Ron. Sorry, I wasn’t trying to contradict you. I’ve only been to Australia cities (on business trips) but it seems it’s like the USA where I lived in New England - private land usually has no uninvited public access. Contrast that with ‘old’ countries like the UK, where you have 1000’s of rural footpaths (often 100’s of years old, some prehistoric) which are considered ‘highways’ that the landowner has a legal duty to maintain access. So, if a farmer ploughs a field with a right-of-way across it, he has to reinstate the path (flatten it with his tractor) within 2 weeks. It’s a joy to be able to walk in the countryside and hardly have to walk on the road. BTW: I heard an amusing anecdote on the radio yesterday: someone was driving in the remote Australian outback for ages along a long dusty road by a fence line. Eventually, there was a gate in the fence with a sign “Shut the bl**dy gate!”. All good. Near the East and SE coast paddocks are between 1 and 1,000 acres and public roads do not traverse them nor have gates. As you move further inland the paddocks get bigger. Some well established roads do pass through farms and there are stock grids and or gates on the boundaries. Not shutting a gate is considered akin to stealing stock - if they escape not all may be captured and that costs time and money. Hence the sign you mention. Sometimes “Please shut the gate” doesn’t register. Eventually the boundaries of the stations disappear. On the road from Port Augusta to Alice Springs you travel through part of the Woomera Rocket Range. There is no security gate. At the time I drove that road there was still classified testing being conducted there. Maralinga is a bit further west and when exploding nuclear weapons I think they closed the roads with some small barrier and sent parties in jeeps to shoo off the aboriginals whose land it was. A prohibited entry notice was posted in the town newspapers. You are far more likely to encounter a kangaroo on these roads than cattle. I have a photo of two kangaroos grazing near me during an activation and it now adorns my rarely issued QSL card. None of my photos of sheep or cattle on summits are near as good as those on this thread. The custodians of VK3/VE-124, Wombat Hill. 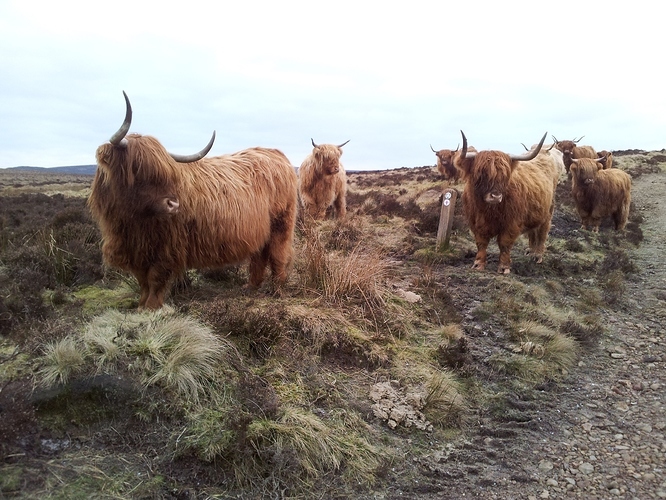 These guys were just curious and very stubborn!! We had permission from the land owner to access the summit (he requested that we carry some rocks to the summit cairn). En route to East Cairn Hill GM/SS-282 in February 2016. A right load of softies that just looked at us as we passed. We have encountered others on our travels and they have always been docile. Observation suggests that is a steer, not a bull. No horns and no err … um …visible. Last time he turned his back on a Landcruiser a terrible thing happened to him. He’s not falling for that again. I’d still be deferential to a grumpy steer. I walked the Offa’s Dyke path many years ago and was chased through a field by a bunch of bulls… I later learned that Wales is the only place in the UK where you’re allowed to have only bulls in a field. Not sure if that’s still the case. First they wandered over to see me… I kept on walking… then a trot… then a full sprint!